Hyperpigmentation has a variety of causes and some of your dark spots will actually diminish. There was a time when as a person with dark skin, your skin could handle just about anything. I've lived a few years and as far back as I can remember, I never saw anyone with skin challenges that I see today. 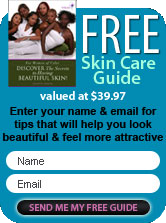 I didn't see blemishes, dark spots, or uneven skin tones. My Grandmother had one friend, Ms Maggie that had Vitiligo. Other than that every person I knew whether it was family, classmates or classmates families, everybody had beautiful skin. The only time I ever saw a major challenge was when a person was cut and their skin would keloid or someone was bitten by a mosquito and they scratched the bump too much and caused it to run. This brought on problems, but that was in the days of when your grandmother would pull an herb from her garden and she'd take care of the runny sore and the discoloration. Have you ever asked yourself as a person of color, why we're so challenged with our skin now? My grandmother told me it was because we'd gotten away from the land. She meant we'd began to eat food that was not prepared by us for us and it was causing us problems and not just with our skin. Is it time to return to the land? LoL !!!. I don�t know a lot of people that are interested in starting their own gardens but there are food sources that offer organically grown foods that will actually feed your body and not leave you feeling depleted of energy and feeling drained. Is the food you eat real? Do your fruits have seeds in them? What real grape or watermelon has no seed? If you�re not eating real food, how do you expect your body to benefit and produce beautiful skin? The better the food you feed your body, the better your skin and hair will appear. Filter your water or drink it from a natural spring. Have you ever drank water and still felt thirsty or tasted the chemicals? The food and water that you take in feeds and nourishes your cells. Your cells are part of what produce the melanin in your body. Melanin gives your skin, eyes and hair its color. Its job is to protect your cells� DNA and keep it healthy. When your cells are not healthy, your skin is not healthy. The sun, inflammation (acne, eczema), injury and hormones (menopause, puberty) all play a role in Hyperpigmentation. Hyperpigmentation occurs when abnormal amounts of melanin are produced leading to dark pigmentation in your skin. Here's the thing with hyperpigmentation, all skin types are prone to it, but it�s more common in darker skin because there�s more melanin and melanocytes to respond in an aggressive manner. When your beautiful black skin experiences discoloration, it gets dark black, brown spots and patches show up. Is There a Secret to Eliminating Hyperpigmentation in Darker Skin? Secret, NO! Can you help in avoiding it? Yes! Eating healthy foods, lots of green foods will feed your cells and produce great skin. Organic is better. The less flesh you eat the better. Illness begins in your colon and flesh has a way of lodging itself to colon walls. When flesh ferments in your colon, your skin is the first place you show that there�s a problem. Breakouts occur, you squeeze or pop the pimples, trouble brewing. Dark spot, uneven skin tone in the making. Hydrate with water, not everyone can consume the same amount of water, so listen to your body and you'll know when you�ve had enough. The typical rule is to drink half your body's weight in water. Water hydrates and cleans your system. The cleaner your system, the better looking your skin will be. Topical products are great in caring for your skin and helping to ward off skin discoloration. Exfoliation as part of your black skin care regimen will remove dead skin cells, which can cause your skin to appear dull, gray and ashy. Don't forget medications can have an effect on your skin. And the almighty sun is king of the heap. Wear a wide brimmed hat to shield your face, especially if you're going to be out in midday sun. That's it for now. If you found this article helpful, share it, tweet it or link it to your friends.